During the second half of the 19th century the Victorians became notorious for their love of animals and owning pets such as cats and dogs became very popular. Some believe this is because the Victorians saw them selves as more humanitarian than previous generations and others suggest that home owners were sentimental about life in the country and owning a dog was a way of sharing in the country lifestyle. 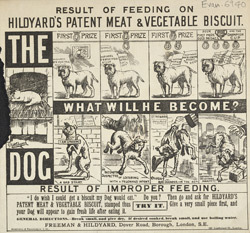 Having a pet many also have been another way of demonstrating wealth, dog food, like that featured on this leaflet was expensive as were collars and other accessories and only the wealthy could afford them.